Turkey Bombs Syrian Christians. Will Trump Act to Protect Them? Devastation in the Syrian Christian town of Derik, after the Tuesday bombing by NATO member Turkey. Emboldened by his win in a power-grabbing referendum, Turkish President Tayyip Erdoğan has decided to slap Uncle Sam in the face. Today I heard even more unsettling news: Turkey has launched ground attacks against the U.S.-allied Kurdish fighters who man the front lines against ISIS, alongside Syrian Christians. Those courageous Christians defending their families are hoping that the Trump administration halts these attacks. They are a blatant attempt to rebuke U.S. influence in the region. Emboldened by his win in a power-grabbing referendum, Turkish President Tayyip Erdoğan has decided to slap Uncle Sam in the face. What Syrian Christians fear most is a Turkish ground attack on their heartland, the Khabour Valley. If that happens, they will pull back from fighting ISIS to defend themselves against Turkey, a member of NATO. I quickly got confirmation from both Syrian Christians and Yazidis that the air attack had indeed occurred. In total, 26 airstrikes were carried out. The Turks hit many civilians and SDF defense forces — allies of the United States. 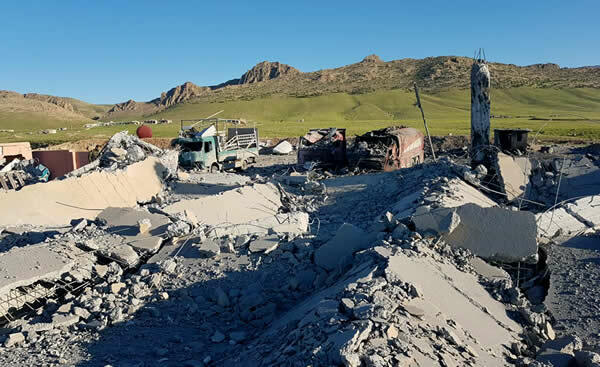 There was a total of 20 casualties near Derik. 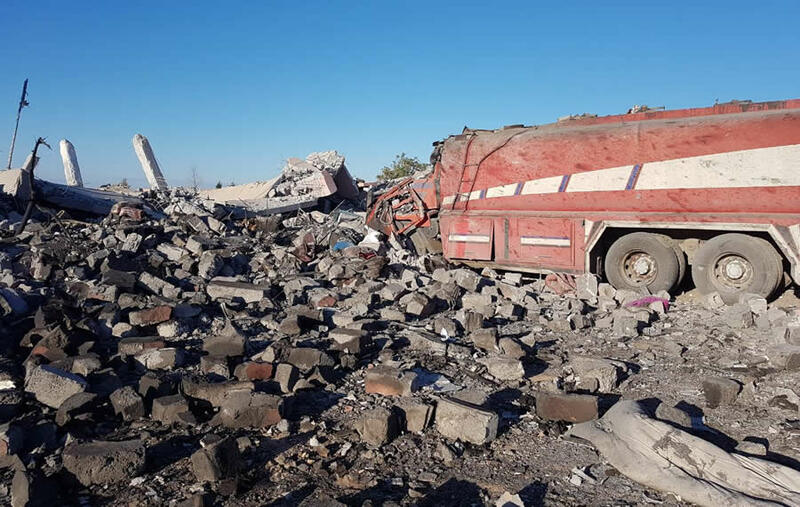 A media center and small headquarters of the Kurdish YPG were hit. The Kurdish YPG is part of the U.S.-backed Syrian Democratic Forces, along with the Christian Syriac Military Council, Arabs and others. 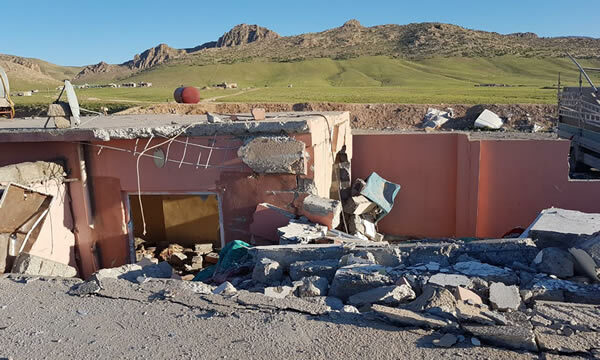 In Iraq, the airstrikes hit the Yazidi defense forces (YBŞ), who lost two fighters, while three civilians were wounded. Five Kurdish Peshmerga were killed as well. All these groups have been cooperating with the U.S. in fighting ISIS and protecting religious freedom. 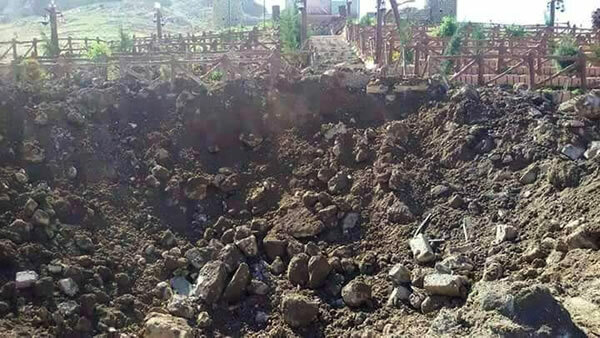 A crater is seen in the middle of a Yazidi graveyard, holding victims of ISIS and the civil war, after Tuesday’s bombing by NATO member Turkey. Of course this is a nerve-wracking experience for the people of Derik. This Christian town is a nice place that had so far escaped the damage of war. When you stand on the roof of one of these houses you can see the Turkish mountains looming over the flat countryside of North-East Syria. There is a very nice hotel that kept going despite the war. Derik is an example of Christian resilience in the face of civil war and ISIS. ISIS is far away from Derik. It never even got close to it. There was no legitimate reason whatsoever for such an aggressive act against these people. Will President Trump make it starkly clear to Turkey that it may not bomb Christian towns? Even worse is the attack on the persecuted Yazidis. I have read reports today that these displaced people, who lost everything due to ISIS, could see the bomb blasts from their tents. A harrowing experience for a people that just survived a genocide. The aftermath of Turkey’s Tuesday jet attacks on Syrian Christians and Yazidis. Both the Syrian Christians and the Yazidis quickly released their statements this morning. The media already picked up what happened and reported the Kurdish casualties. Lost in the media reports was a crucial fact: This was a direct attack by a NATO member on a Christian town in Syria. How will the U.S. respond? Feeling betrayed, members of the Syrian Christian, Kurdish and Yazidi communities wondered if the U.S. had sold them out. Was Trump eager to please the Turkish government? My personal take is that the U.S. was at first not aware of the intentions of the Turkish jets. The Americans were caught by surprise. This seems the most logical explanation: These strikes also posed a direct threat to U.S. forces in Northern Syria. One explanation swirling around is that these strikes were an attack in response to President Trump’s commemoration on April 24th of the Armenian/Assyrian genocide committed by the Ottoman empire and its “Young Turks.” If so, Turkey proved that it wants to continue that genocide. On the same day as the attack, commanders of the U.S. forces based in Northern Syria inspected the consequences of the airstrikes together with SDF commanders. Furthermore, the State Department and Pentagon both described the United States as “deeply concerned” by the strikes. They said that their objections were raised directly with the Turkish government. They warned that Turkey’s targeting of Kurdish groups could distract from the common campaign to defeat ISIS. A building destroyed in Turkey’s Tuesday bombing. However the core question is: What solid assurances will President Trump give to the victims of this bombing? Will he make it starkly clear to Turkey that it may not bomb Christian towns in Syria and Yazidi villages in Iraq? That this is really over? One crucial way to end the suffering of these peoples is to arm them properly and to empower them politically. The Yazidis of Sinjar want all Kurdish forces to leave Sinjar. They wish to run their own defense forces and to achieve autonomy within Iraq and the Iraqi Constitution. This would also clear the way for autonomy for the Syriac-Assyrian Christians of Nineveh Plain in Iraq. That would take away any pretext for Turkey to attack the Yazidis ever again. In Syria, the Trump Administration should make the logical choice to arm the Syrian Christians. Their Syriac Military Council is a real force fighting ISIS — independent of Assad. As I’ve written here before, there is no good reason why Christian forces are singled out and denied the weapons the U.S. gives to their Arab allies. Giving the Christians weapons for self-defense would send a powerful signal to Turkey that attacks on helpless religious minorities are a “red line” the U.S. won’t let Turkey cross. Finally, President Trump should give much more attention to the Federation of Northern Syria, where religious freedom prevails. Indeed, as John Zmirak and Jason Jones wrote, the Federation should serve as the model for a new, federated Syria. To this end, the Trump Administration should declare publicly that no force will be allowed to attack SDF-controlled areas. He should declare it a “no-fly zone,” off limits to Turkey or Assad’s air force. Russia would raise no objections. President Trump needs the cooperation of Syria’s Christians and Yazidis to end this war the right way: leaving behind religious freedom for all. He should not allow Turkey to blast that opportunity into rubble.